Today no one questions the assertion that Ca2+ is a crucial regulator of growth and development in plants. The myriad processes in which this ion participates is large and growing and involves nearly all aspects of plant development. 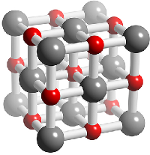 Ca2+ is an essential element; however, its role is elusive. When examining total Ca2+ in plants, the concentration is quite large (mM), but its requirement is that of a micronutrient (mM). Ca2+ is not usually limiting in field conditions, still there are several defects that can be associated with low levels of this ion, including poor root development, leaf necrosis and curling, blossom end rot, bitter pit, fruit cracking, poor fruit storage, and water soaking. Strengthen cell wall structure - calcium is an essential part of plant cell wall. It forms calcium pectate compounds which give stability to cell walls and bind cells together. Helps in protecting the plant against heat stress - calcium improves stomata function and participates in induction of heat shock proteins. Helps in protecting the plant against diseases - numerous fungi and bacteria secret enzymes which impair plant cell wall. Stronger Cell walls, induced by calcium, can avoid the invasion. Calcium deficiency symptoms appear initially as localized tissue necrosis leading to stunted plant growth, necrotic leaf margins on young leaves or curling of the leaves and eventual death of terminal buds and root tips. Generally, the new growth and rapidly growing tissues of the plant are affected first. The mature leaves are rarely if ever affected because calcium accumulates to high concentrations in older leaves. 'Bitter pit'. Fruit skins develop pits, brown spots appear on skin and/or in flesh and taste of those areas is bitter. This usually occurs when fruit is in storage, and Bramley apples are particularly susceptible. Related to boron deficiency, "water cored" apples seldom display bitter pit effects. 'Blossom end rot'. Symptoms start as sunken, dry decaying areas at the blossom end of the fruit, furthest away from the stem, not all fruit on a truss is necessarily affected. 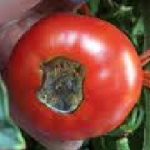 Sometimes rapid growth from high-nitrogen fertilizers may exacerbate blossom end rot. 'Cavity spot'. Oval spots develop into craters which may be invaded by other disease-causing organisms. Stunted growth, central leaves stunted.